I like to start this column with a picture. Last month was a pretty one of a sunset behind the Tower at West Tiger-1. 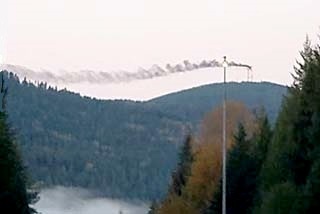 This month, pictures of a Master FM Antenna being destroyed at West Tiger-2 on the morning of November 8th. It was a clear cold morning, permitting many to see this as they were driving I-90 between Issaquah and North Bend. The fire calls started in about 6:45 a.m. Had it been one of those soggy/rainy days, no-one may have noticed. Not much the Fire Department could do other than to put out objects that had fallen to the ground that were still burning. As you can tell from the following, the smoking antenna system was observed from different directions. Whereas I am employed by American Tower to look after this, and other sites on West Tiger and Cougar Mt., this day will be remembered for a long time. Interesting that the first call I received was from Ted Buehner who was working at KRKO at the time. Shortly after that, phone calls and emails were all in parallel. In all my years in this business I have had my share of antenna failures. This is the first time that I’ve experienced an antenna that was actually on fire. I’ve had them burn-up…but in this case the fire was contained within the antenna. In this case, the fire started with a failure of a portion of the antenna that ignited the ABS coverings around it that’s designed to minimize the effect of ice and snow on it. These coverings are called ‘Radomes’. To ignite ABS requires a temperature of approx. 416 degrees, indicating the electrical fire that started it all was quite hot. 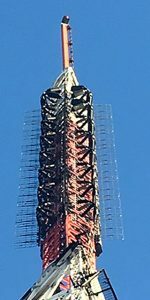 The pictures of the antenna clearly show the fire worked its way down the multiple section antenna due to pieces of burning ABS igniting antenna sections below. It spread horizontally due to wind. This picture was sent to me by a friend who lives on the hill to the north of the site. Here you can quite clearly see how all but the top of the antenna was burning. The tower to the right in this picture, is at the same site, however was not impacted by the fire. Antennas at the top of that structure are used by TV Stations. I don’t know if American Tower has naming rights here, however, from this day forward I submit that this antenna be forever called OLD SMOKEY. These pictures were taken by a WSDOT Traffic Camera located at SR18 and I-90. Note the tower on the left in this picture. This is the ‘other’ West Tiger tower site (Called West Tiger #1) about a half mile to the west. Due to the angle of the picture, it looks a lot shorter. Actually, the tops of all of these towers at the same elevation – 3148 ft. above sea-level. ABS is a very common material, used extensively for many other things that you encounter routinely. For example, plumbing. That black plastic pipe under your kitchen sink is likely ABS. 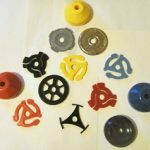 A lot of components in your vehicle use the stuff as well. It’s used to make carrying cases that are quite popular, even canoes. Perhaps one of the most interesting uses of ABS is for building LEGO. 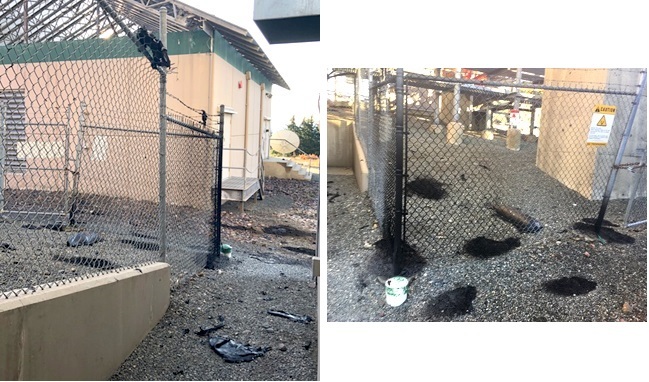 If you look close in the pictures above, you can see pieces of the melted ABS sticking to the fencing at the site, as well as laying on the ground. American Tower, the owner of the facility, had a lot of clean-up to do. In the picture on the right you can see the whole antenna. It was, perhaps, the biggest FM transmitting antenna in this area in terms of number of radiating elements, called bays, with 32. The pole above the FM Antenna was used to support a TV station that used to operate at this site. At the very top is the Beacon Light that did not function after the fire. The antenna is made in 2 versions, 3-sided and 4-sided. The latter was used at West Tiger, as you can see from the above picture. I took a few more pictures that better show what happened. Below left is one showing the top of the antenna that was not impacted. Note how the black ABS radomes on the antenna are intact and not melted. Looking further down the tower you see the picture on the right, note how the Radomes are gone and the amount of ‘blackened’ surfaces. A close up of one of the damaged portions looks like this. What cannot be seen is the damage to the interior of the antenna. 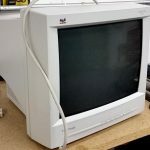 So what was the impact on which stations that were using this site and antenna? Thankfully, all of the impacted stations had auxiliary/backup transmitter facilities that they could use. 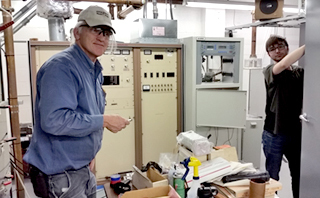 Hubbard had the foresight to install relatively new transmitters at their auxiliary facilities, that enabled them to continue to broadcast HD Radio multi-cast channels as well as some of the other features that listeners have become use to expect. The others are using older equipment that is not capable. I would guess that, in light of this event, this might change. The position these stations find themselves in, is ‘now’ they only have one transmitter. So what happened next? 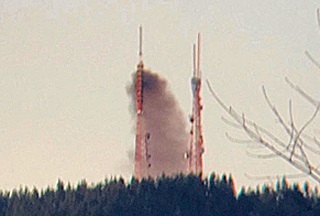 The following Saturday and Sunday, the manufacturer of the burnt antenna had a crew on the tower to assess the damage. That information was provided to the engineers at ERI, who then conferred with executives at American Tower to formulate what to do next. Certainly all involved are anxious to get this resolved so that transmitting from this location can result. Complicating all of this is the fact that the weather at West Tiger is only going to progressively get worse as we move into Winter. This location, like others in this region, will experience, periodic ‘weather windows’ (periods between storms) when tower work can take place. The bottom line is nothing is likely to take place as fast as many would wish. The failure of the FM Master Antenna at West Tiger -2 has left several stations scrambling, knowing that when their Main Transmitter is not available, their Auxiliary is now their main and that could well mean they now don’t have a backup should that unit fail. Let’s take iHeart Media’s stations in Seattle as an example. 96.5/Jack FM is now depending on a 40 year old Collins transmitter on Cougar Mt. They recently brought in a low powered, but much newer BE STX transmitter as insurance. Ditto for their 102.5/KZOK. Their KISS 106/KBKS operation is much better off. That station just so happens to have their backup also located on West Tiger -1, the original site on the mountain. A bit of history here, thanks to all the shuffling of stations and owners. The present 106.1 Auxiliary used to be the KMPS/94.1 Main. Here, in this picture, you can see electrician Bob Ricker standing in front of the 1988 Vintage Continental transmitter. To the right is a newer Harris transmitter that’s being installed (as a backup for the Auxiliary). With his hand in a cabinet is Daniel Sipe of iHeart. Perhaps a good thing is taking place as a result of this event. Stations are reviewing how they deal with their Auxiliary Transmitters. Historically, back-up transmitter facilities have been created out of hand-me-down equipment, a former main transmitter is now the auxiliary, etc. Often the auxiliary will operate with less power or coverage and without such features as HD radio, RDS, etc. The exception to this has been Hubbard who has recently installed new transmitters for their 92.5 and 98.9 stations at Cougar. The bottom line is when your main transmitter is out of commission, especially for a long period of time, that auxiliary/back-up is suddenly your main and you have no backup. Another lesson learned here is that a true back-up facility means you have nothing common with your main operation. Perhaps the one place where radio (and TV) stations have a weakness is at their studios. I like to say the ‘most feared’ item for a broadcaster is Plastic, Yellow and comes on a roll. I’m talking about what’s commonly called Caution Tape. A Police or Fire Department can wrap this around a broadcaster’s studio and no one is going in. Broadcasters need to plan for what’s called SPOFs or Single Points of Failure, and failure to be able to access your studio due to a hazardous material incident, etc. can mean the loss of millions. Meanwhile, there are two radio sites being constructed at Tiger these days. One on East and the other on West Tiger, all for the new King County Radio system. On Nov 12th this truck load of tower parts was spotted at Tiger Summit awaiting transport in smaller trucks to the tower site. A table was recently released by Nielsen showing the market rankings and population information. A lot of eyes are on this, as market ranks can and do change. 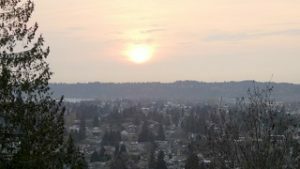 In our case, the Seattle Tacoma area continues to be Market #12 with just shy of 4,000,000 12+ Population of 3,932,400. Our Hispanic number is 343,500 with the Black population listed at 261,100. So how do we compare with our neighbor to the south, Portland? They are market #22 with a Metro Population of 2,383,500. Denver is #19 with 2,749,800. Now, if Nielsen had included Vancouver B.C. in its table, their 2,463,431 Metro Number would make it about market #20. Yes, NYC is still #1 with about 16.5 Million followed by LA with about 11.5. From the memory file, can you believe it was 33 years ago that a little local software outfit called Microsoft introduced Windows 1.0? November of 1985. 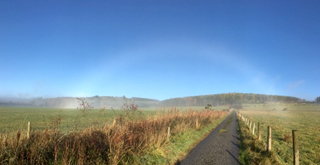 We’ve all seen Rainbows….and many have seen Snow bows….but how about a “Fog Bow”? Same principle as a rainbow. In this case, it’s a mixture of sunshine and ground-fog. Anyone else seen one of these and perhaps snapped a picture? I don’t know about you, but I am getting about 3-4 robocalls per day. Recently I was away from my phone and noticed I’d missed a call. (Like a dummy) I called the number and got some poor soul who made it clear that his number is being used by a robocaller and he is now getting a lot of calls. It appears that no one is able to do anything about it. According to published reports, there were more than 12 BILLION robocalls made in the first 4 months of this year (that’s 4,000,000 per hour) and the volume is increasing. And to think that we used to grumble about Spam and Junk Mail. The agency also wrote to USTelecom to thank it for its leadership in the traceback effort. About two years ago, a broadband industry trade association, USTelecom, formed a group to share information among carriers and providers to help “traceback” the traffic of illegal calls to the originating provider. Industry participation in this call traceback effort has proved useful in the Commission’s enforcement efforts to combat illegal robocalling and spoofing. As the FCC and industry move forward on call authentication, consistent participation of all network operators is critical for helping consumers and enforcing the law. A record $120 million fine of Florida-based time-share marketing operation which made almost 100 million spoofed calls over a three month period. A $82 million fine of a telemarketer which made more than 21 million robocalls to market health insurance. A $37.5 million proposed fine of an Arizona marketer which apparently made millions of spoofed calls that appeared to come from consumers. In addition, the RAY BAUM’S Act of 2018 made clear that laws prohibiting unlawful spoofing apply to calls originating overseas if the recipient is in the United States. To that end, we strongly encourage companies accepting overseas traffic to do what they can to ensure the number is not unlawfully spoofed. I thought all of these were gone. Well, not until just the other day when I removed this beast from service. Hard to believe that we used to praise a display like this. I forgot how bulky and heavy they were. This was in an enclosed equipment rack where someone had installed fans to deal with the heat they produced. The way I recall it, a friend of Clay Huntington (Tom Read) had been urging Clay to build a radio station, and that he did with KLAY-FM going on the air in Tacoma on June 17th 1960. Clay located his transmitter in various locations over the years…a telephone pole at a concrete pipe plant, top of an apartment house, a tower adjacent to a golf course. During those early years various engineers took care of his technical needs, among them Terry Denbrook and Al Bednarczyk. Al later handed the reins to me. Clay eventually moved his FM to Indian Hill, where shortly thereafter he sold it to Ray Court who increased power to 100 kW. Today, KLAY-FM is owned by iHM and was (until the recent Antenna Fire) operating from West Tiger-2. Along the way Clay purchased the then, off air, 1480 AM in Lakewood, giving it the call letters of KLAY (For some reason, I’ve always liked those call letters). I handed off the technical chores of Clay’s station to Nick Winter who went to work moving the station from 1480 to 1180 and increasing power. In terms of technical facilities, the station operates with 5 kW Non-Directional Day and 1 kW directional at night. 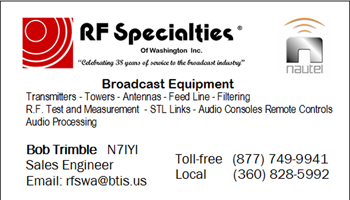 They also have a CP for an FM Translator. After Clay passed back in 2011, family members continued to operate KLAY as perhaps the Tacoma area’s only locally originated AM radio station. (The studios were technically in Lakewood) This too will come to an end with the announcement that they are selling Clay’s radio station to Sacred Heart Radio for a reported $450,000. This will close a chapter on Tacoma broadcasting that spanned almost 60 years. Sacred Heart has been expanding over the years from Seattle to Spokane, Yakima and more recently Olympia, where they purchased the legendary KGY (now KBUP). You can read more about them here – http://sacredheartradio.org/home/. At this time it’s not known whether they will keep the call letters KLAY. My understanding is Sacred Heart Programming originates in Kirkland, likely meaning that yet another Tacoma Radio Station will not be originating programming in the South Sound. The only major Radio station that still does is KNKX which is bucking the long trend of leaving Tacoma and is building a new facility in Downtown Tacoma. After two employees were killed as they drove to work on SR 18 earlier this month, the CEO of Snoqualmie Casino has offered $1 million in funding to the Washington State Department of Transportation. This comes two weeks after a mother and daughter died in a fatal accident on their way to work at Snoqualmie Casino. Since 2014, four casino workers have been killed on this highway. So the tribe is proposing sending a million dollars of its casino earnings to speed up a state study on making SR 18 safer. As you read, many broadcast engineers drive this route to reach the access road to get to West Tiger Mountain. I wonder if the FCC was surprised about the up-rising and number of C-Band systems in use? Certainly there has been some significant push-back to the wireless industry that had their eyes on this spectrum for their own uses. My prediction remains the same. 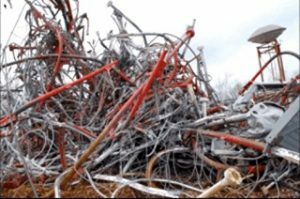 The FCC will, due to the power and pressure from this every growing spectrum use, be creative and chop up the band so they can proclaim that everyone wins. Congratulations to KING 5 on turning 70. The station has been putting historic items on their Web Site that makes great viewing. I especially enjoyed the shot of the old KRSC building on 4th Ave South that later contained KAYO Radio where some famous people worked, such as Ben Dawson! It’s time again to review the latest Radio numbers for the Seattle area. Hubbard’s 92.5 is at #1 edging out KIRO-FM who was #2. Will have to see if the lack of their main transmitter plant will have any impact. KUOW is close behind at #3, proving again that you don’t have to play rock and roll and commercials to be successful. Another station impacted by the tower fire is Entercom’s 94.1 ‘The Sound’. The fact that they are #4 in the market perhaps re-enforces their decision to dump the historic KMPS country format and go after the AC audience. Another ‘fire-struck’ station, KZOK is at #5. KIRO-AM continues to be the AM ratings leader at #10 (tied with KPLZ). Bonneville’s other AM, KTTH, is outdoing KOMO-AM, however this might have been an election bounce? NWPB’s KVTI appears to be gaining some audience share. Making a surprise showing is NWPB’s KSWS. Surprising because they are transmitting from Crego Hill near Chehalis with modest power. KNKX HD-2 is still the only HD Channel making a showing. I have always been interested in the changes made in ‘human interfacing’. 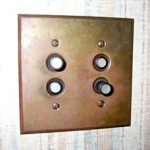 Here’s an example – Push button light switches. I wonder why we have to keep changing the way we turn on the lights. Obviously this was prior to Alexa! 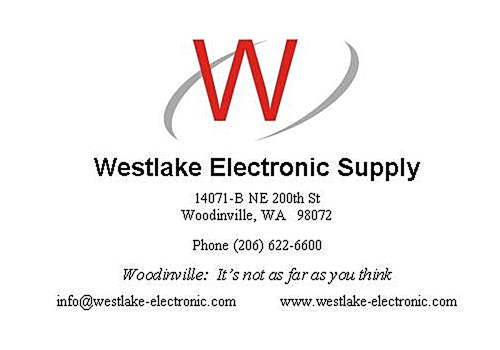 Recently Burk Technology’s Paul Shulins was at the Seattle SBE Meeting talking about a nifty new product they are rolling out, designed for remotely managing complex transmitter sites. Many of us in the room looked at each other when he spoke of keeping track of transmitters incorporating tubes. Yes there are still transmitters out there with Tubes in them, but their days are numbered. I ran across this item recently in my collection of ‘Stuff’. This was something that a Transmitter Engineer would use to keep track of the performance of those big tubes. Tubes don’t run forever, they wear out and need replacing. 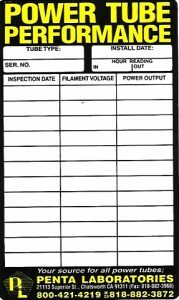 The way you extend the life of a Transmitter Tube is by carefully managing the Filament Voltage. Are we going to see another FM station on Cougar Mountain? Apparently so. In this case it will be K253CG, an AM Translator for the displaced Kirkland AM Station KARR. According to the FCC it will transmitting on 98.5 from the former KUBE Tower at the Ratelco Site. The 300 foot guyed structure is the home of a number of FM’s including Hubbard’s 106.9, KRWM, at the top. I recently spotted this little item at West Tiger 2 (the home of Old Smokey). It’s a small white-board where engineers would leave notes to each other. 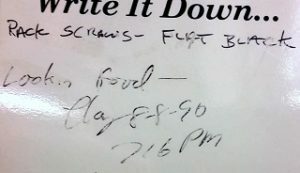 Apparently my note of ‘Lookin Good’ from 28 years ago is still applicable! Do you recall that tower failure in Fordland, MO back in April that killed Steve Lemay, a tower worker from this area? OSHA has investigated the matter and concluded the fault lies with the Contractor for the collapse of the 1891 foot tower. 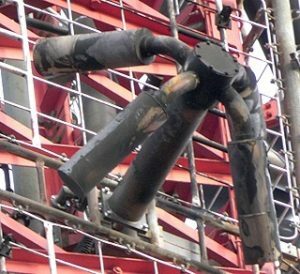 The report concluded that removing bolts on diagonal braces during the reinforcing process compromised the structure, that Lemay used undersized equipment, and that TCI failed to approve the design of a temporary frame prior to replacing a diagonal, as it was required to do. 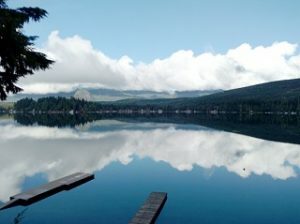 Once again, former Entercom Chief Dwight Small shared this picture taken from his dream home on a lake north of Seattle. As you can see, a wonderful departure from the ‘rat-race’. Must be tough looking out your bedroom window at this! Here’s picture taken from my back deck. This showing the impact of the smoke from the fires in California on our Sunsets. If Webster wrote the first dictionary, where did he find the words? *…and how did he know how to spell them? Christmas – What other time of the year do you sit in front of a dead tree and eat candy out of your socks? If I forget to mention it – Have a great Christmas.